Tourism in Ladakh has risen in the last few years and many people prefer to self-drive to Leh – Ladakh for satisfying their hunger for adventure 🙂 … This means that you must know about petrol or fuel availability in Leh Ladakh. You should also learn how to carry spare fuel for your Ladakh trip, important places where petrol pumps exist in Ladakh and other tips. This article talks in detail about this topic of petrol availability in Ladakh. So what is this problem about fuel in Ladakh? An example on how to manage spare fuel in Ladakh? Ladakh is a remote place with a lot of desolate routes in Ladakh. There are many tourist places in Leh – Ladakh like Nubra Valley, Pangong Tso, Tso Moriri, Sham Valley etc and most of them are connected via Leh town except the adventurous connecting routes which exist between them. However, it always a good idea to plan your Ladakh journey well enough so that you do not come with a nightmare experience from heaven, which I found many people had this time when I was present in Ladakh. And, one of the key areas or things is to know about road conditions that you might expect along with the fuel stations or availability of fuel within Ladakh or inroads to Ladakh like Manali – Leh Highway and Srinagar – Leh Highway, once you reach Ladakh and drive on your own. Hence, it is important to know about the petrol availability in Leh Ladakh, so that you are not stranded in the middle of nowhere in a desolate place in Ladakh without any fuel in your car or bike. Are you worried about fuel availability in Ladakh? In the first article of this series “Ladakh Self Drive Tips“, I talked about the important tips for a self drive road trip to Ladakh. In this article, I will talk about petrol/diesel or fuel availability within Leh – Ladakh. 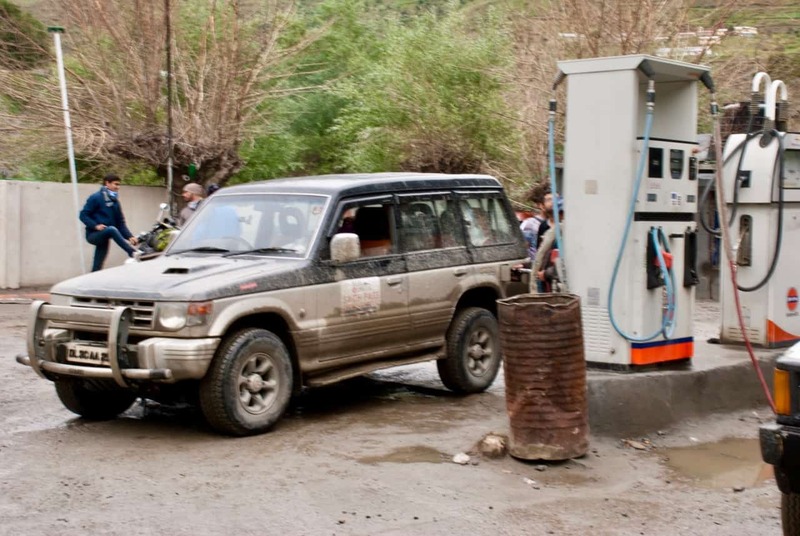 Knowing about the petrol pump in Ladakh will help you in your Ladakh drive. Without fuel (petrol or diesel) one cannot drive or ride and we all have a limited capacity fuel tank in our vehicles. The mileage of the vehicles also decrease in harsh terrain like Ladakh where hills are not the only thing that results low fuel efficiency but rough or non-existent roads, rarefied oxygen (just guessing on this one) also joins the party. Most of the time you drive or ride in low gears, hence, overall vehicle mileage reduces on a Ladakh trip. You must account for about 70% mileage that you are used to getting in normal conditions back home. Hence, one thing that you should always keep in mind when self riding or driving within Leh – Ladakh is that petrol or diesel is available only in Leh town (2 petrol pumps are in/around Leh) and one petrol pump is present in Karu town which is about 34 KMs from Leh on Manali – Leh Highway. There is one petrol pump in Diskit, Nubra Valley town as well. As of 2016, Diskit petrol pump is fully functional now and also work in winters. Petrol availability in Leh is tremendously improved as well now for the last few years. The biggest problem is that most of the tourist destinations within Ladakh are not near to Leh rather about ~150+ KMs away from Leh and a return journey will make them about ~300 KMs. You will be able to easily get away with it if you are coming back to Leh every time you go to one or other destinations because you can get your vehicle refueled and ~300 KMs trips can be managed in most bikes and car very easily. The problem is when some of us do not want to come back to Leh rather do circuits like Leh – Nubra Valley – Pangong Tso – Leh or Leh – Pangong Tso – Tso Moriri – Leh or Leh – Nubra Valley – Pangong Tso – Tso Moriri – Leh etc. by taking the direct route in such places. Such routes are not possible to be done without carrying spare fuel (petrol/diesel) along with tankful of fuel in the vehicle or relying upon the black fuel availability in remote villages. Hence, you can keep these routes in mind and plan to carry spare petrol with you based on the distance you will be traveling if required. In case you may run out of fuel on any of these routes, you can also try villages on these routes (especially Tangste, Chumathang, Khalsar, Chusul, Nyoma, Hanle, Pang etc.) where you may find the black diesel/petrol sold by the villagers, (of course, highly likely, with quality compromised) which can be handy in such odd circumstances. As an example, from Leh to Hanle to Umling La to Tso Moriri to Leh, you are looking for about 800 KMs. Now considering 13 ltrs of fuel capacity of a Royal Enfield 500cc bike, on a mileage of 25 KMPL in mountains, it will do 325 KMs but you need about 32 Ltrs. Let us look at the availability of petrol pumps in Ladakh region and on which routes do they exist. This will help you plan your self drive trip to Ladakh with some peace of mind and do the math where and when you need to carry spare fuel on these routes in Ladakh. The journey on Manali Leh Highway is 474 KM long from Manali to Leh. After Manali, once you cross Rohtang Pass, there is only one petrol pump in Tandi village, about 10 KMs before Keylong. Tandi petrol pump is the only place where you will get fuel on Manali Leh Highway. The next petrol pump will be 365 KMs away at Karu just before Leh town. You will get fuel in black at dhabha tents of Zingzing bar, Sarchu and Pang. So, in worst case you can always get the petrol at these places though at a higher price and compromised quality. Unlike Manali Leh Highway, the other road to Ladakh from Srinagar to Leh has few petrol pumps and there is no need to carry any spare fuel on this route. Once you start from Srinagar, you will get fuel pumps at Ganderbal, Kangan, Sonamarg, Kargil, and Khalsi. After Kargil, Khalsi petrol pump is just 95 km from Leh. So, you can see no shortage of petrol pumps on Srinagar Leh Highway. About every 100 odd km< there is a petrol pump on Srinagar Leh Highway. Hence, no need to carry fuel with you or buy fuel in black when travel from Srinagar to Leh. When you reach Leh from Srinagar or Manali side, you can always get petrol at the fuel pump in Leh and Karu. There are a couple of petrol pumps in Leh and one petrol pump is in Karu, about 35 KMs away. Leh petrol pump remain functional all throughout the year. So, you can get petrol even in winter in Leh but unfortunately, you cannot drive to Ladakh in winters. There is one petrol pump in Nubra Valley at Diskit village. As of 2018, Diskit petrol pump remains fully functional even in the winter season. So, a trip to Nubra Valley including the visit to Turtuk will not require any spare fuel to be carried. You can always top up at Leh and then at the petrol pump in Diskit for making a trip to Nubra Valley including Turtuk. Hence, no need to buy any petrol in black for a higher price and compromised quality on your trip to Nubra Valley. There is no petrol pump at Pangong Tso or any villages nearby. About, 130 km away towards Leh, Karu petrol pump is the only petrol pump near Pangong Tso. However, you may get black fuel at Spangmik, Tangtse or Chusul villages. There is no petrol pump at Tso Moriri or any villages nearby. About, 200 km away towards Leh, Karu petrol pump is the only petrol pump near Tso Moriri. However, you may get black fuel at Nyoma or Chumthang villages. As you read above, there is no petrol pump at Pangong Tso. 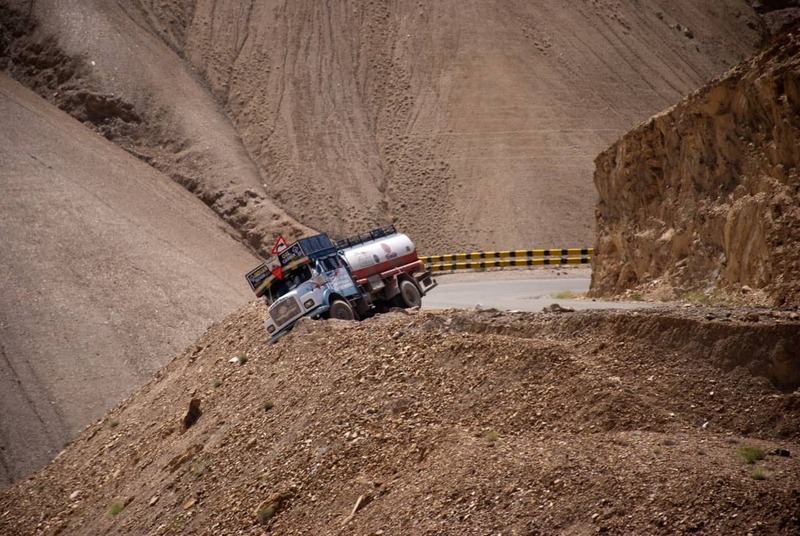 You must carry spare fuel with you from Leh in case you are planning a trip on the direct route of Pangong Tso to Tso Moriri or Pangong Tso to Hanle via Chusul. If the need arise and you did not carry spare fuel with you on this route, you may get petrol available at Tangtse, Spangmik, Chusul, Nyoma, Chumathang villages, of course in black only. Hanle is about 270 km from Leh and the nearest petrol pump to Hanle is Karu, about 235 Km away from it. So, for a round trip from Leh to Hanle to Leh, you will need to carry spare fuel or rely on petrol available in villages in black. You may get petrol in villages of Chumathang, Nyoma and Hanle itself. If you are planning to travel to Hanle from Chusul route from Pangong Tso, you may get the fuel in black at villages of Tangtse, Chusul as well. Best way to carry spare fuel is to take them in sturdy metal jerry cans which are leak proof. Those used in the army are the best ones. If you cannot get hold of the Jerry cans, carry 2 ltr cola bottles with you as they are leak proof plus they are easy to stock up. Avoid carrying spare fuel in Ladakh in plastic containers or plastic jerry cans as they might burst. In a car, 20 ltr water containers are much better and sturdy than any other cans. Always use plastic to seal the opening and prevent spillage. No matter what type of container you take to carry spare fuel, always leave space and fill about 90% of capacity to avoid spillage. 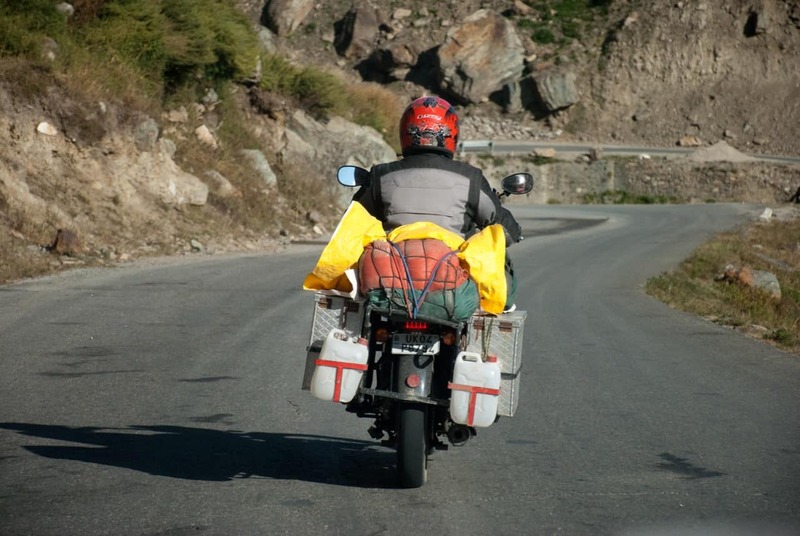 When carrying spare petrol on a bike in Ladakh, it is highly recommended to protect the plastic containers you are using from stones or pebbles that might cause a crack or leak in it. So, use a protective layer below or around it, tarpulin could be used too. Make sure you always carry a thin cloth to filter in the impurities in case you need to buy fuel in black. If you rent a bike in Leh or Manali, those bikes do not have good mileage due to wear and tear and rough usage. Hence, do not take the words of the bike rental guys and take the bike for a local Leh ride to see how much mileage you are getting from it. Using that as baseline, take its 80% mileage to do the calculations as in remote routes, it will further decrease. In the end, let us look at some frequently asked questions about fuel or petrol availability in Leh Ladakh. Do I need to carry extra fuel or petrol on Srinagar Leh Highway? You do not need to carry any extra fuel or petrol on Srinagar Leh Highway. 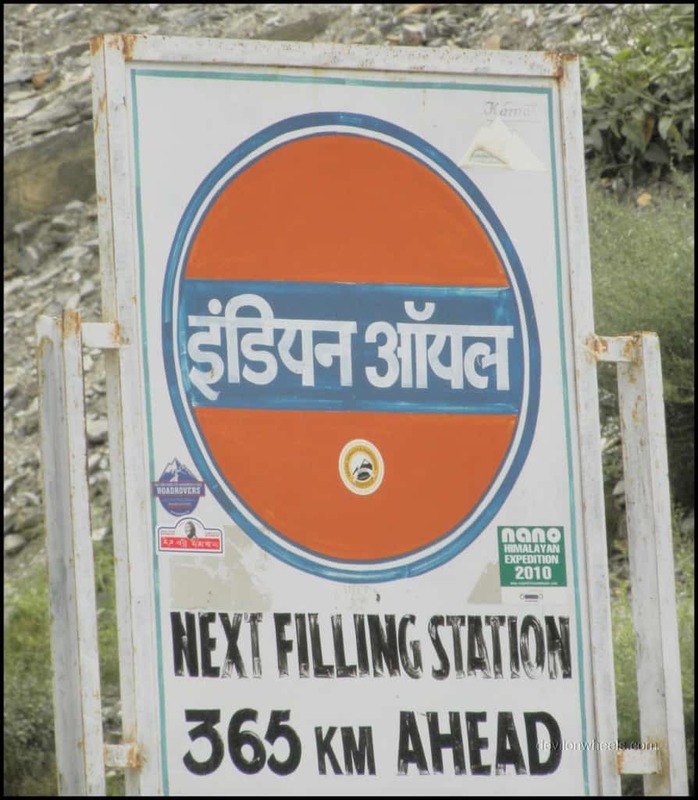 There are quite a few of petrol pump available on the 434 KM long Srinagar Leh Highway and even if you top up your tank at Kargil, you will easily reach Leh which is about 240 KMs from Kargil. Do I need to carry extra fuel or petrol on Manali Leh Highway? You do not need to carry any extra fuel on Manali Leh Highway. Once you start from Manali, you will get the fuel at Tandi petrol pump. After that, you have to travel 365 KMs before you reach Karu petrol pump near Leh. Most cars should be able to cover this distance without the need of carrying spare fuel or spare petrol. How many petrol pumps falls on Manali – Leh Highway? Tandi petrol pump is the only petrol pump on Manali Leh Highway. Hence, there is only one petrol station between Manali to Leh at Tandi. What are the available fuel stations between Srinagar-Leh-Manali route? You can get fuel at Ganderbal, Kangan, Sonamarg, Kargil and Khaltsi on Srinagar Leh Highway. 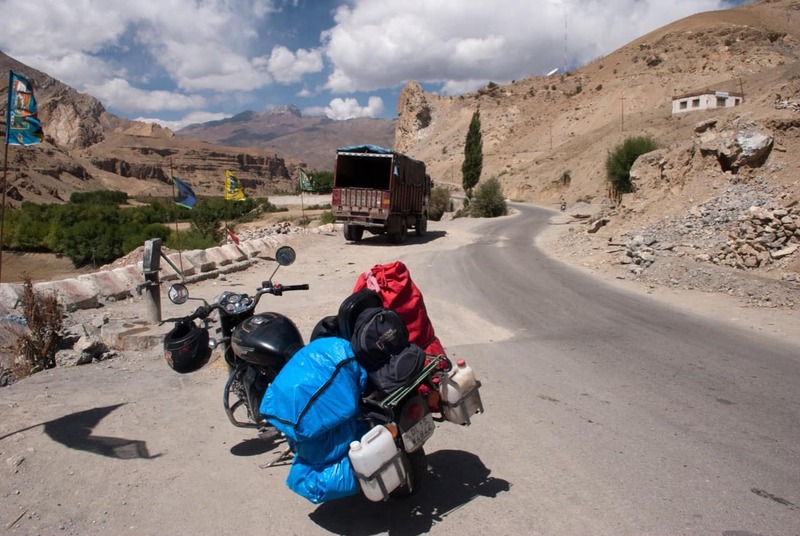 Should I Carry Fuel For My Ladakh Road Trip? Most places in Ladakh have fuel or petrol availability. Some remote routes do not have any petrol pump but you can get petrol in black in the villages en route, of course at some compromised quality and higher price. How to carry spare fuel to Ladakh? Best way to carry is to have sturdy metal jerry cans which do not leak. The ones that are used in the army are the best. The second best option is to carry petrol in 2 ltr cola bottles in Ladakh as they are leak proof. Where do you need spare fuel for Ladakh Trip? You do not need spare fuel on Manali Leh Highway, Srinagar Leh Highway and most parts of Ladakh. However, if you plan to take direct routes within tourist destinations of Ladakh, then you need to carry spare petrol on such routes. How to manage fuel availability in Leh Ladakh? I hope the above article will be useful in planning your trip to Leh – Ladakh by giving you a better idea when you might need to carry spare fuel (petrol/diesel) and how much based on the mileage your vehicle offers. 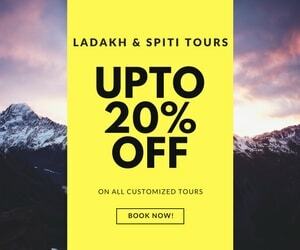 If you know your friends or family are planning a road trip to Ladakh, do share this article with them to help them make a memorable Ladakh trip. This article has been updated with the latest information about fuel availability in Leh – Ladakh and is kept up to date every season to reflect the current status. Feel free to suggest any further updates you deem fit. Nikhil, you cannot do local sightseeing in Ladakh on a bike rented outside Leh. So, you need to park outside Leh rental bike in Leh and do the sightseeing with a bike rented within Leh. If you are taking a friend’s bike, then you need a NOC document from him stating that the bike is for private use only, he is the owner of the bike with RC number and then he authorizes you with your DL number to ride the bike personally for this Ladakh trip. It will be helpful in case someone stops you and objects. Thanks Dheeraj for your reply. Now I will plan accordingly. Hi Dheeraj , what is the procedure to apply for the NOC and what is the format ? NOC format is nothing formal but you can just mention your name with DL number and the person to whom vehicle belong should certify that it will be used for personal use only. Thanks a lot Dheeraj, one more thing since you said its nothing formal so do I need to get it stamped from RTO or any other Govt. organisation ? Not really, it just states that the vehicle is being used for personal use and is not rented. If you want to make it official looking, you can get it notary stamped. No need to stay at Upshi,continue to drive to Leh it is just about an hour or more from Upshi to Leh with good roads. Jispa to Leh is easily doable now a days with good roads on Manali – Leh Highwau. 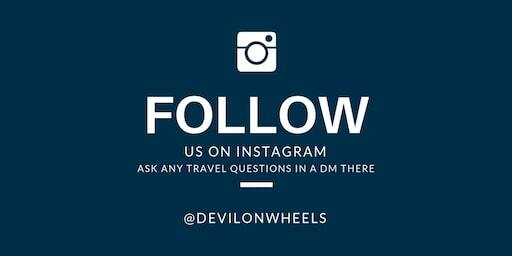 Do you fly out of Leh or will come back to Manali? We have bike avenger 220.we are 2 . 1. How And when to carry fuel.after leh or before? It depends on the circumstances and our health .On reaching leh, we will either move to Ladhak or back to manali. Please tell us whether we need to carry fuel before reaching leh or after it? You may not need fuel if you tank up at Tandi. need some help from your side. 1. Pls suggest any modification required in Itenary. 2. Delhi Leh Delhi will be through flight, from Day 1 to Day 8, as per plan we will hire an RE 350CC, what will be mileage expected for RE 350 CC ?? 3. For above itenary what are the ILP Permits required ? Are they available online ? Well, I will not suggest skipping Turtuk against river rafting. You can still do river rafting on Day 5 by going directly from Hunder or Diskit in Nubra Valley to Leh and Phey/Nimmu rafting point. Hi Dheeraj, I am planning to do Leh – Hanle (overnight stay) – Tso Moriri (Overnight Stay) – Manali in one go. I will have my 43L Scross tank full at Karu. Roughly average would be 15KMPL. Is it possible without having to carry extra fuel?.. Best is to carry extra fuel because you will need for doing about 850 KMs. Also, is the average 15KMPL in cities? If yes, consider about 65% of the average only in higher hills of what you usually get at home. Thanks Dheeraj! City avg is 20. So i guess i should stick with 13kmpl. Apart from 43l tank, i have a jerry can of 20l. I believe there is a gas station at Tandi. Will this be ok buffer to sail through..
That should be sufficient enough Sandeep. Just for a backup try to see where you stand at Pang with fuel and may be take spare about 10 Ltrs if the need arise. Best will be to get it at Hanle itself. We are planning a journey on 2nd June i have doubt regarding petrol issues. The doubt is here we will be having two bullets. So are there any option for petrol refilling Except karu as it a circuit of around 1000 km till we reach tandi 110 km from manali. or please help me in the details that whether we can get petrol there or not or adjust my plan accordingly. Thanks for the update can you when manali leh highway is opening we are leaving on 2nd june from delhi. Thanks for your quick response. Manali – Leh is expected to open by 25th May subject to weather conditions. I am more optimistic by end of May. Need your help on a serious matter. I am going to leh on 4th june i am taking my uncle’s(fufa ji’s) bike there i have no id proof which proves our relation. I read somewhere your blog of this issue please help me. 1. So what should i do??? 2. What documents i can carry there id or something??? Vaibhav, all I can say is the surname are matching on ID, it should be easy to prove. Else, take whatever possible document you possibly can with you and in case of confrontation, try to resolve the matter amicably by assuring it is a private bike. Leave early for the trips from Leh and avoid joining large groups which tend to be the target of checking. PLEASE DO NOT make a trip to Tso Moriri while going to Leh from Manali and also avoid overnight stay at Sarchu as you will not be acclimatized to sleep at these places. 1. For petrol pumps, you may read article above. 3. Hire in Leh unless you want to pay twice. No permits are required on above route which yo mentioned. Permit from Manali to Rohtand route is required. No permit is required to travel upto Leh. But to kardungla, nubravelly, pan gong, tsomorni are required. Single permit with photocopies for each route. To make permit photo and identity proof required. No permit is required to travel to Khardung La, Nubra Valley and Tso Moriri and Panogng Tso if you are Indian citizen. Heyy Dheeraj!! I live in Pune and i’m planning to go to leh next week, solo. I’ll be staying at Air Force Station Leh as my dad’s in the Air force. I wanted to travel to Pangong Lake and from the many possible options, i found renting the bike to be the best. I wanted to know, is the trip feasible alone? Also, should i carry spare petrol? If so, approx how much should i carry? Should i make it a 2 day trip? I’m not interested to travel any further than the lake! Your advice will be much appreciated!! Dheeraj brother, I want ur advise on our upcoming bike trip to Leh regarding the “Permits” required (as ppl say that its NOT req for INDIANS). Is it TRUE.?? It wud b very helpful if u can guide out with the petrol pumps for the trip.. Moreover Leh to Sarchu (Day 12) and Sarchu to Manali (Day 13) as per ur advise is back to back 230-240 kms so we can break that into 3 days. What is ur views about this??? We hd 2 bullet classic 350 nd we r 4 frnds??? Nw tell how much litre cans should be carry by us for spare fuel??? Looks good to go but a bit hectic. You will need permits to travel to Hanle from Pangong Tso and can be possible that you are turned from Chusul post itself. hey Dheeraj, how R U doing ??? We had planned a road trip from Delhi-Manali-Leh-Srinagar-Jammu-Delhi commencing on the 11th of September 2014. Considering the floods, what is the current situation of the roads and is it advisable to disembark on 11 Sep 14 ??? Farog, traffic on Jammu – Srinagar might be resumed one way in couple of days. Hey Farogh, Inbox me your Number on [email protected]. Any other recent feedback on the road condition post floods ??? hey bro, actually m having a intruder 1800. and m thinking of whole India road tour on it from jan first week. I wanna know that what could be the most distance between two petrol pumps in Jammu and leh area? my bike average is 8kmpl tank capacity 19.5 litres. as in my journey of 18000 kms m gonna pass through main cities only so in other states it will b not such big trouble. pls guide me how can I cover leh and Jammu. Please check the article above which enlists the distance between the fuel pumps in Ladakh and which route will have which coverage. 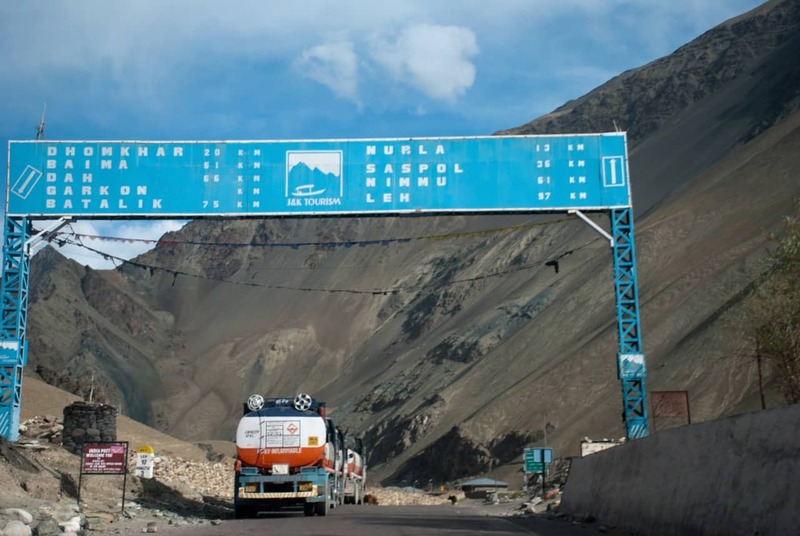 On Srinagar – Leh Highway, there wont be much of an issue. But, in Ladakh since the petrol pump is only in Leh there you need to carry extra fuel with you. Even for a trip to Nubra Valley which is 130 odd KMs one side, you will need fuel. In Ladakh there will be decrease in mileage of the bike too by about 30-35% as well. On Manali – Leh Highway, the difference between two petrol pumps of Karu and Tandi is 365 KMs. 1. Can we go by innova self drive? 2. How can we know that the road is open? 1. Yes, you can take private Innova to Ladakh as self drive. But, it cannot be a taxi. Further to your above post, would like to know why the Innova or any vehicle should not be Taxi, if self driving. Being a Tour Operator I have all the vehicles with T permit and myself planning a 12-15 day road trip to J & K + Kullu – Manali – Shimla, Entering via srinagar and Exit by Shimla Manali – Chandigarh Route. Sarchu-Tandi(115km): Refuel and go ahead to Spiti. 1. What do you think about 650 km journey(Leh-Tandi) w/o petrol pumps? 2. or there are any on the way? Satej, personally I feel it should be more than 650 KMs though I have not done the exact maths. You will get fuel in black at Chumathang, may be at Sarcu/Pang too but no guarantee. but, any how you need to carry extra fuel with you. Why missing on Tso Moriri? Point taken Bhai. I’ll be doing 520 km Loop with extra fuel as “Karu-PangongTso-Chusul-Chumathang- Tso Moriri-Tso Kar-Upshi” with refill at Karu and Upshi. 1. Is Road via Chusul open? 2. We two guys are carrying our own tent. Can we camp at Pangong Tso and Tso Moriri? Any precautions and suggestion. Satej, I think now the fuel pump at Upshi is no longer functional/present. It is at Karu only. So, you may need to refuel at Karu. 2. Read the posts: FAQ | Can I pitch my own tents or camps anywhere in Ladakh? Below is your prepared itinerary for some one. I would like a bit of changes in it. I would be grateful if we can exchange emails for my better understanding and approx cost. – If you have time then check out, floating market, Shalimar Garden. I know you would be busy & yet have graciously agreed to reply to a lot of people. Yet I wish to pick ur brains for this trip I wish to plan. Kindly advise. Rishi, you are good to go with this one. It is very much the common itinerary on the blog without extra day and overnight at PAngong Tso. Perfectly doable. On Day 9 you can go to Hanle from Leh. Then on next day can come to Tso Moriri from Hanle and follow the itinerary as above. Please keep in mind to do this stretch you need to have about 750+ KMs of fuel as backup. we will be 12 person in xuv500 and ecosport. will ecosport cover the itenary as above? Yeah ecosport will manage the above Ladakh itinerary with careful driving. There is a fuel pump at Karu, 36 KMs from Leh towards Tso Moriri – Hanle route, tank up there and carry extra fuel from there only. Then take a shot. If you feel you can make it to Manali then refuel at Manali only because the fuel at Tandi might be not good with quality as people suggested sometimes. So, rely on Tandi after crossing Keylong if you think you will not be able to reach Manali or to short on fuel. Else, use your spare fuel from Karu only. Farogh, we will be launching DoW Store over coming weekend and you can get you Sticker Pack from the DoW Store itself. Please watch the Main Menu or Facebook Page for the updates for a link to DoW Store. can i take my family along on this trip to ladakh in my beat diesel having GC of 175mm and 57.6 bhp power. Farogh, for hatchback/sedan taking on Manali – Leh Highway and Ladakh, please refer the link: FAQ | Can I do Leh – Ladakh trip in Hatchback or Sedan? for more details. sir can u gave me use full things to get with us in trip of delhi-manali-leh-sringar-delhi. sir can u tell the good shop where we can hire bike on rent for leh. Yes, you can rent bikes in Leh and Fort Road in Leh is full of such shops that rent bikes. Depending upon the condition, model, make and tourist rush you can get bikes starting from Rs 800 to Rs 1300. Rather than booking over phone, it is much better to visit the Fort road, check 4-5 shops over there and get a good deal after checking the bike conditions. I am planning a Leh trip on May’13 with my wife. Below is the itinerary planned. 2. Private taxi for entire tour. Judhajit, brother this is one heck of a ride!! Delhi to Srinagar and Srinagar to Leh both are done in 2 days and you are doing them in one day?? Very difficult. Then Pangong Tso to Manali again not possible to be done. Over all a road trip will need atleast 9-10 days if you are looking for a hectic trip to Ladakh. Javed, thanks alot. Also, sorry I could not get your question. What development are you looking forward to? Javed, road condtions will remain mostly as mentioned in the article. They hardly change over a time. You need permits to travel to these places. i am actually thankful to “Mr. Dheeraj Sharma” for his blogs and post on site..
inspired from it and got a boost & way for my desire to explore leh ladakh.. I am planning for a road trip from MUMBAI in my new SWIFT DZIRE..
We are 4 of them with age group of 25 – 28..
will like to get guidance for the follwing queries..
1. when can we start our trip (when r d roads open)..? 2. wats the best tym to explore leh ladakh..? 3. we wanna make it as soon as possible..as we dont wanna get whole snow melted..
4. suggest an itinerary with most of the places are covered and with less no. days and all the main spots and highlights are involved. 1. Best time to start the trip will be third week of June upto third week of July before the monsoon starts, when both roads are likely to be open and stabilized too. 2 + 3. 15th June to 20th July would be ideal for road trip if you like snow, else make it later half of September for great vivid colors. 4. You can check a very balanced and most common itinerary for Leh – Ladakh followed by many travelers including me at the link here for 14-15 days: Most Common Itinerary for Leh – Ladakh. Please Avoid Sarchu Stay Because off Oxygen Problem. Doing it in the other direction would have made much more sense but it is fine towards the late season due to the risk of closing of Manali – Leh Highway for a day or two. Sirf 5 din mein possible nhn ho payega, you need more than 5 days. 2 din jaane mein lagenege and 2 din aane mein. Dheeraj mai 6/09/12 ko start ( From Manali)to 11/09/12 ko Return pahuchne ka program banau to kesa rahe ? And i have royal enfield Classic 350 mai Batal to Baralacha La Jana Chahta hui way Chandra Tall ( parallel to Chandra river Route ) PLEASE SUGGEST/ADVISE. Sikander bhai, pehle aapko Manali se Chandratal jana hoga Battal hote hue and then uske baad wapise aana hoga Leh – Manali highway par Baralacha La jane k liye. Manali – Chandratal Camps – 1 Day, Chandratal Camps – Chandratal – Keylong – Day 2, Keylong – Baralacha La – Keylong – Day 3, Keylong – Manali – Day 4. One day left can be used at Chandratal. I am planning to visit Leh with my Wife in May’13. 1)First,is it actually a good time to visit the place. 1. It is fine time to go there, make it late in May so that all lakes are frozen by that time. 3. For the current leh – ladakh taxi union rate list 2012-13 including the contacts of some reliable taxi drivers within Leh – Ladakh, check the link here. You can get about 10-15% of discount by directly getting in touch with drivers and of course, talking in person rather on phone always help in bargaining more. going to leh end of july. how is the weather usually . i hope its ok to take children 10/11 years. have searched over the net and found that families do take children of this age. similarly what kind of basic medical kit is required or better to carry , to deal with weather or AMS. It is fine to take the children of such age group because AMS do not matter with respect to age. It can happen to anyone of any age. The only issue with children is that they tend to exert the body considering it the same kind of place and this elevates the chances of getting struck with AMS. Secondly, they are not much expressive about their uneasy feelings, so it is parents who need to watch out and take care that the child is not suffering from uneasy feelings, headache or nausea and is behaving properly. With 5+ year child, I think he/she would be able to convey the uneasiness with little efforts. If you notice any such feeling or he/she tells you about such a felling then please do not ascend anywhere, either descend to lower altitude or stay at the same place to watch things overnight and if symptom increase then start descending immediately. Same is applicable for any adult as well. And yes, do keep the body adequately hydrated!! I will suggest you read some tips mentioned in the article here for better acclimatization and reducing chances of AMS. Any information about the mobile networks on the route to Leh from Manali…??? Mobile networks on Manali – Leh Highway works upto Keylong or Jispa only and then you are at your own upto Upshi/Karu near Leh, where you get them back. and will bajaj avenger comfortable to take on this roadtrip?? Not sure, about the comfort with avenger since I do not ride much. For contacts, do you want them for Leh or Manali? You can rent bikes in Leh and Fort Road in Leh is full of such shops that rent bikes. Depending upon the condition, model, make and tourist rush you can get bikes starting from Rs 600 to Rs 1200. Rather than booking over phone, it is much better to visit the Fort road, check 4-5 shops over there and get a good deal after checking the bike conditions. What about the visiting on July 1st and 2nd week? Is it the good time to visit? Yes, July first two weeks is a good time to visit before the onset of monsoons. Once, monsoons start things become ugly especially on the in-roads to Ladakh. Have a great trip Vikas, I am glad the information was useful to you. i read your posts and found them very helpful. can i seek more help from you. me and few of my friends are planning for this trip from Manali – Leh – Manali on bikes. 1) Can we make the trip in 7-9 days on Bikes from Manali to Leh and back to Manali? 2) How much could it cost for the whole trip renting bikes, hotel, and site seeing which come in the way? 3) can we ride on avenger on this route smoothly? 4) we are planning in the in month of August – will it be fine? 1. In 9 days ex. Delhi, yes but difficult with days mostly on roads. Do you have 9 days ex. Delhi or ex. Manali? 3. Technically cannot say being not a rider. But, I have seen even splendors/discovers doing it. 4. Well, in August you need to keep buffer days. Mostly you will be running with monsoons in these 9 days because it is only Ladakh where you do not find monsoons much otherwise most parts of Manali – Leh Highway will be affected by monsoons only. I hope this helps. Please let me know incase you have any queries or doubts. and yes the trip is excluding delhi, 9days is from manali-leh-manali..
and if in August its raining there than which month would be better? I guess then it should work fine for you because you can atleast keep 1 day as buffer. The only issue is with blockades which might happen on Manali – Leh Highway due to rains. Once you cross Baralacha La the other side is a rain shadow region and hence not much issues there 🙂 … If yo can then plan after mid-September when resides and you have less tourists plus better road conditions. Please do not stay at Sarchu, you guys will not be acclimatized for the altitude of Sarchu and might get hit with AMS. On the way back, you can stay at Sarchu. Since, I see you will be doing it in shared taxi, so you will not find partners easily to do this customized journey. In private taxi, you can do the above route in 4 days but mind you that after Pangong Tso upto Manali all three days will hectic and tiring. Yes, you got it right. Yes, you can hire bike as well. Go to fort road at Leh and you will find plenty of bike rental shops there. Fo good quality ones but a bit high in prices check with Apex Bike Tours. Instead of Keylong – Manali – Delhi, do it like Sarchu – Manali (doable) and then Manali – Delhi. This way you will be able to have that much needed buffer day that can be used in case of any disruptions. Sorry my mistake Keylong- Manali and DElhi not in a day.. I hope we can reach Delhi the next day by taking an evening bus on Day 9 itself..?? Vikas, We plan to do a similar itinerary. You need to carry spare fuel so that you can do this 950+ KMs without any fuel pump. Nubra to Pangong via Shyok is real bad, via Wari La depends upon if it is open or not. Pangong Tso to Tso Moriri is again very long and very bad road, mostly. Sarchu to Kaza again is too long for one day. Kiagar Tso comes on the way to Tso Moriri after Sumdo. dheeraj bhai pangong to tso moriri -tsokar -pang kitna distence hai? Is it doable in bolero 2 wd with ladies also??? Doable but the roads via Changthang (Merak – Chusul – Nyoma) are not really roads rather dirt tracks that does create some sough of discomfort. If that is OK, the beauty is totally unmatched. You have the most vital information abt Ladak. Thanks for sharing. Really appreciate. Ek dum sahi Sandeep bhai. If one do not plan the ride carefully to Ladakh, many people go running and coming back saying, I will never go to Ladakh due to such ill planned journey that causes nightmares on their trip.